Bill Gates, Warren Buffet, and Richard Branson are not only billionaire entrepreneurs, but also well-respected globally for their business insights. This trio of titans regularly tops bestselling author lists and each is guaranteed millions of views whenever they write a LinkedIn post, blog or newspaper article. These men constitute the very model of thought leadership. A thought leader is defined as an individual or firm that is recognized as an authority in a specialized field, and whose expertise is sought and often rewarded. With the democratization of information made possible by the technological developments of the digital age, thought leadership is increasingly being adopted by businesses to increase brand awareness, consumer loyalty and sales. The good news is that you don’t need to have Bill Gates’ level of wealth or fame to get involved with thought leadership. Most of the tools you need to create content and draw in an audience are readily available for no charge, and if your company has a website or social media account then you’re already in position to get started. The best place to get started with thought leadership is by writing an article on your company’s website on an interesting topic of your choosing. From here the benefits are multitudinous. Google rewards companies that produce regular articles with high search engine rankings, and your existing clients and website visitors are given social proof of your expertise. 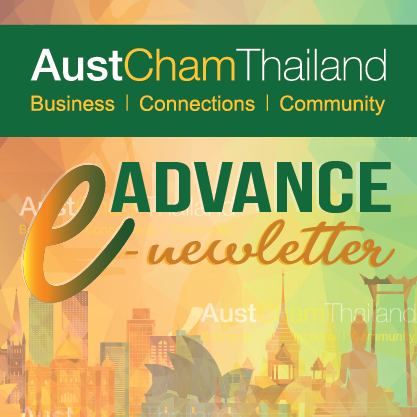 The Australian Chamber of Commerce Thailand is always looking for ways to help our members and the thought leadership approach to marketing fits perfectly with our core values of Business, Community and Connections. If you’re a member and would like to share your insights with other Bangkok-based professionals by writing a thought leadership article to be hosted on our website, please get in touch. David Norcross is a member of the Austcham Communications subcommittee and Managing Director of Lexicon Business Communications: a digital marketing, copywriting and visual design firm based on Surawong Road.